Earlier this week I had the chance to attend this year's Microsoft Ignite New Zealand. This was the ninth year I attended the event, previously known as Microsoft TechEd. Many, many things changed over the years and while Microsoft Ignite is still a technology event at heart, things changed, just the same as Microsoft did over the years. If you were one of the couple of thousands of attendees you had the chance to learn not only from technical sessions but also from personal development sessions, ones created to let people progress in their careers not only by their geeky prowess but by being better at how these are used in the context of relating to yourself, other people in your job and your life. If you attended the keynote session you'd have heard from local Microsoft people and international guests who showed how to use technology to "empower every person and every organisation on the planet to achieve more." The message was powerful and easy to understand: technology for technology sake was hot. Today's technology is used to make lives better. From using Internet of Things and Big Data to make better, intelligent wheelchairs to solving global water challenges with cloud technology. I had the chance to talk to Microsoft experts from different areas, from Donna Sarkar (MIcrosoft Windows 10 and Windows Insider) to Donovan Brown (on how Microsoft is making DevOps an integral part of its stack) and all of these had the passion make this mission come to life. During the same week Microsoft announced its new Surface device. A long term project, which goes back to the first Surface concept (remember the Surface table?) this all-in-one computer integrates design and functionality, plus extra accessories that can help developers create new interfaces and experiences, making it a dream - one that will be here in early 2017. Watch the video below and tell me it's not a work of art? In the past I have looked at Geekzone data to find trends, influentials and other information. This data was used to support decisions such as “should we create a new forum for this subject” or “should we close this sub-forum?” and so on. We also used it for marketing, answering questions such as “Where are the discussions around [insert subject here] and who are the participants”. Lately I have been using a lot of Microsoft Power BI at Intergen. It is a great tool to create dashboards that tell a story, or for people to find and work on trends that data reveal. So I decided to use Power BI on Geekzone as well and make some of this information public. Basically I created a Geekzone Power BI dashboard which visitors can use to check some of the data we have – answering questions such as “What sub-forums have the most discussions?” or “How many participants reply on an average discussion in the [insert sub-forum here]”. It is even fun to see how big jumps caused sub-forum to come up – for example looking at when Freeview was launched in New Zealand or the months when a new iPhone or Samsung device came out you can clear see a trend growing on each related sub-forum. Around 2013 we created a +1 feature on Geekzone. This allows people to support a reply by giving an “approval” without having to post “I like this”. The user who posted the replies can see who voted for his post. But when you look at the data you start seeing different things. For example you can see who gets more votes in different sub-forums and where their interests lie. Every year, around March, I post a Geekzone State of the Browser based on Google Analytics data. Last night I decide to add this data to Power BI. This means that instead of having an annual report based on the last 30 days of data anyone can have a look at reports updated to the previous day, with data covering any period from a month to all the data we ever had – just clicking on filters. This data covers the entire period we have Google Analytics on Geekzone – since December 2005. You can clearly see when smartphones as we know now came to the market – the small presence of this technology appearing for the first time in 2010. You can also see the decline of Internet Explorer and the rise of Google Chrome. I have been fine tuning these charts as we go – and there’s more to come. Data is updated twice daily so you know it is always the freshest dataset around. Go have a play: Geekzone Power BI dashboard. My previous entries in this blog have been about how bad Vodafone's HFC (commonly know as "cable") have turned and how slow things are moving towards a resolution. This is something that started happening since the company introduced "unlimited" plans back in late 2014. Customers have had almost constant periods where Internet speeds were anywhere from 10% to 50% of the offered plans - on a service that was known for reliably and consistently deliver 100% all the time. This is not solved yet as we still see reports of work in progress, new node replacements and customers still seeing the dip in speeds in the evenings. When we bought a house one of the main points in the checklist was the possibility to connect to the cable network. This was when broadband wasn't a thing, when people in ADSL areas couldn't get more than 10Mbps, etc. It was a good run, more than 16 years but enough is enough. I have been waiting patiently for fibre to arrive in our area. I said many times in the Geekzone discussion on this topic that if fibre was available here before Vodafone fixed their HFC woes, then I'd saw. When Chorus started work in our area I was worried about install costs, time, etc. Well, last week we got a card in the mailbox. Fibre is here, and available now. So I had to go ahead and swap. 2degrees broadband got our business. Install was initially set to a couple of weeks later but I got a call from our new provider saying Chorus had a team working weekends and if I minded them doing the job this Saturday. By all means, go ahead! The install was easy. We are lucky that we didn't need consent from neighbours and lucky our connection was an aerial drop instead of an underground cable. The two technicians had the whole thing installed and tested in about 90 minutes. I swapped our router to the ONT, reconfigured to PPoE using the 2degrees credentials and instant results. 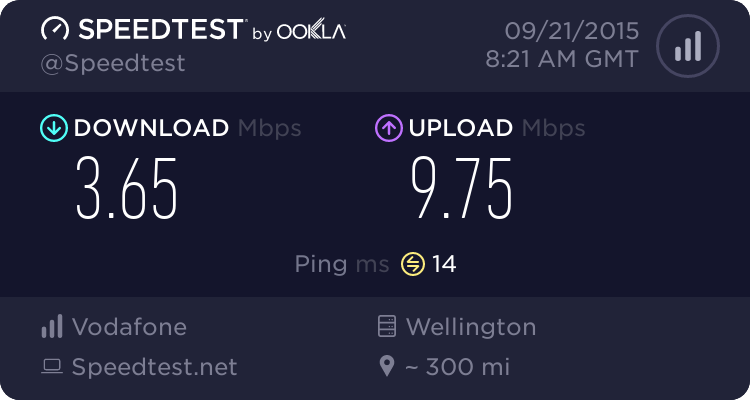 Now we are another household part of the "Number of fibre-connected kiwis" statistics. And one less Vodafone HFC customer. PS. By the way, I found the Saturn Welcome Pack emptying a cabinet drawer while waiting for the Chorus technicians to finish their install. What an interesting twist. It’s a surprise to me then that our media is making it known that Vodafone is planning to invest $22 million in bringing up to gigabit speeds for their cable network without asking the obvious question: if their network can’t cope with customers consuming 100 Mbps now, how can we be sure the 1Gbps service will be “usable”? There is a reason why Wired published an article today saying "there's no such thing as unlimited data". Things to think about (and I am not sure it’s in that $22 million plan): capacity planning, actual bandwidth availability, resource management, setting high expectations. Yes, I’m a pessimist. Or a realist. UPDATE: Vodafone cable is failing tonight, no DNS resolution and proxy problems. How bad is Vodafone cable at the moment? For the last few months (at least since a discussion on Geekzone was created around April 2015, but a couple of months before that) Vodafone customers on cable (the old TelstraClear network) have been trying really hard to keep calm. At some point, after a few complaints Vodafone decided to put some work into the network and sent out a letter to customers promising things would be better by end of September. Once the fastest thing around, with speeds of up to 130 Mbps before fibre was even a dream around the country, the Vodafone cable network (in Wellington, Kapiti and Christchurch) started showing signs of ageing. Things started going downhill with the launch of unlimited plans around end of 2014. People moved to unlimited plans with 100 and 130 Mbps options and soon things were really bad, from 7pm through midnight. And that was even before Netflix opened its doors in New Zealand and the other ISPs started seeing similar performance problems. But it seems most ISPs were not affected or recovered quickly. This is on a 130 Mbps connection, over a wired connection, with a gigabit capable router, to Vodafone's own servers. This service would usually show 130 Mbps at any time of the day but now most of the time someone is at home (in the evenings), when we really want to use the service… it's unusable. The letter sent to customers back in May say work is being done and completion is expected by September. I understand this work involves changes in the core network infrastructure, changes to hardware in nodes, enable more channels, software updates. Up until recently it was pretty easy to use Microsoft Family Safety to manage your child's time and access on a Windows PC. Install the software, create a local account, manage the account online. Things changed a bit with Windows 10 and I am now trying to get around configuring our daughter's access to our laptops at home but so far hitting a roadblock around Microsoft accounts. There are many reasons why I want to do this. First is to make sure we have a set policy around screen time, and this is enforced. Second we want to monitor activities, websites, etc. And obviously filter out whatever is not desirable. I also wanted to be able to monitor her Microsoft Store account to make sure she is not installing anything she shouldn't and perhaps block in-app purchases (in case I put some money on her account to buy a game or two). I tried adding "family" members through the Windows Settings, a feature that requires everyone in the family to have a Microsoft account (no surprise here) but the email invites never arrived and the accounts still show as "Pending". Never mind, let's try this through the "Family " tab in the Microsoft Account website. I invited my daughter (who interestingly is listed as adult on her own account, despite the date of birth clearly showing she is not yet an adult). The email arrived but when I clicked the link it says she's already member of my family. I log into my own account and she's not listed. I tried the other way around - sending an "Adult" invite from her account to mine, and again the link doesn't work. At the moment I am using Norton Family for Parental Control, which works well to monitor, block and filter activities (and on Android too) but I still want control on the Microsoft account itself. Received the email confirming that I am, once again, a judge in the New Zealand Hi-Tech Awards, a traditional technology award sponsored by the likes of Callaghan Innovation, Cisco, Duncan Cotterill, Emulex Endace, Fronde, PWC, IBM, NZ Trade & Enterprise and others. This year's gala dinner awards ceremony is in Wellington, so I am pretty excited about this coming back to our city. Looking forward to finding out more about the entries in the [secret] category I am judging with other three New Zealanders and an overseas judge. I just came home and found a print copy of "Trackers - How technology is helping us monitor and improve our health", a book by Richard MacManus (Wellington-based technologist, founder of ReadWriteWeb and later an author since he sold the blog). The book will be available 1st January 2015, $29.99... Already available as a Kindle eBook (Trackers - How technology is helping us monitor and improve our health eBook). Just looking through the new MInisterial List announced 6th October and I see Hon Steven Joyce is Minister for Economic Development, which according to a footnote “portfolio includes responsibility for ICT”, and in the next page we find that Hon Amy Adams is Minister for Communications. It looks like the New Zealand goverment doesn’t know its TLAs. What part of ICT (Information and Communications Technology) are they duplicating? Also, Hon Steven Joyce is Minister Responsible for Novopay. Only in New Zealand there is need for a minister to manage software projects gone bad. If you have a home theatre, or run a small business you likely have a Network Attached Storage (NAS) devices around. Or even if you just have a huge collection of photos and share the storage with other computers at home. Over time these devices evolved from simple storage that you could access through your network to full computers, running web services, streaming, databases, even virtual machines (just check the TS-451 I had here for a while). Obviously being a full computer we have to treat these endpoints as potential weak links – and the recently disclosed GNU Bash vulnerability is affecting at least one NAS vendor, according to an email just received. I would believe other vendors are also impacted but I have not seen any documentation yet. If you have a NAS at home (or run any UNIX-like operating systems including Linux, BSD, and Mac OS X) then you should really look for a patch/update for your system and get this fixed. QNAP Systems, Inc. has been looking into the recent concerns over potential Bash code injection (CVE-2014-6271) that can lead to security vulnerabilities on the Turbo NAS and other Unix/Linux-based systems. A partial solution for CVE-2014-6271 exists but may result in another security vulnerability (CVE-2014-7169). QNAP is actively working on a solution for this issue, but in the meantime encourages all Turbo NAS users to take the following immediate actions to avoid any possible exploitation of their system. QNAP will keep users updated with the latest information as addressing this issue. If users would like further assistance, please contact QNAP Technical Support at http://helpdesk.qnap.com. UPDATE: Here’s Synology’s page on affected NAS models.